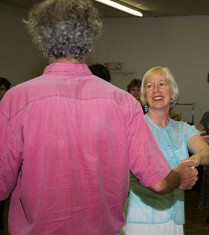 English Country Dancing is a predecessor of square and contra dances. This social dance form is done with partners in different set formations, such as lines, circles and squares. If you've seen any Jane Austen movies such as Pride and Prejudice, Sense and Sensibility, or Emma, then you've seen this lovely form of dance, which has been around for hundreds of years. The music is hauntingly beautiful and the dances vary from lively and jaunty to flowing and graceful. If you can walk and know the difference between right and left, you have much of the basic knowledge you'll need to do English Country Dancing. Beginners are welcome and partners are not necessary since our tradition is to change partners for each dance. No special clothing is needed, other than soft-soled flat shoes that won't skid or stick on a wood floor. (For your own safety and comfort: no spike heels or flip flops.) Most of the women wear skirts or dresses. A good way to begin learning about the specifics of English Country Dancing is to watch these videos posted by the Country Dance & Song Society. For a visual guide to the various dance figures, have a look at Regency Dance Figures, a YouTube channel with numerous useful and informative short clips. A limited number of scholarships are available for SDECD members who wish to attend dance workshops, dance camps and other educational events. Please review our Scholarship Program Policy before submitting an application. Scholarship application forms are now available either in PDF format or as a writeable MS Word® document. If you're still mulling over how to turn your thoughts of a Regency ball gown (or your "Beau Brummell" men's riding outfit) into reality, you need look no further than our Regency Fashion page of this website! It's replete with drawings and paintings, photographs, instructive videos, and helpful information on planning, designing, and executing your Regency-era costume for the next ball, and for many balls to come. The page also includes links to many external resources from which you can get ideas and inspiration.